The monsoon is in full swing around the Valley, and is as unpredictable as usual – dumping an inch or more rain in a short time in some locations and leaving other areas bone dry. 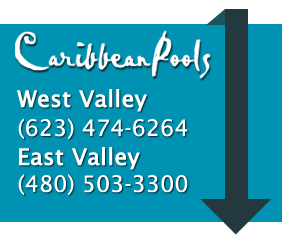 Whether your pool gets a light sprinkle or a heavy downpour, we’d like to put your mind at ease. While rain is acidic, a small amount is usually no problem at all for a pool. A large storm that drops an inch of rain in a hour can change the condition of a pool in a hurry. Of course, here in Arizona, the biggest issue is dirt and debris kicked up by high winds. In addition to the airborne dirt, runoff from awnings, roofs, cool decking, patios, and landscaping mean even more water and debris. You’ve got this – it’s easy. We must admit that whipping out the test kit after a storm can make a pool owner feel like a mad scientist. After the rain stops, skim out any leaves and clean the pool. Test the water and rebalance it if necessary. Check with your builder or professional pool care company to see if you can bypass the filter to eliminate excess dirty water and avoid any extra wear on the filter. Enjoy the rain when it hits and know that you’ll be ready for sunny swimming in no time.